Camshaft alignment tool – BMW No.11 3 240. Remove inlet and exhaust camshaft sprockets  &  complete with secondary chain. Install chain pre-tensioning tool  . During installation of camshaft sprockets, ensure tooth gaps on inlet side aligned towards each other  . Fit toothed shaft with pin to inlet camshaft sprocket. Push in toothed shaft until only 1 mm of spline is visible  . Install washers and nuts  . DO NOT tighten. Install plate spring with mark ‘F’ visible  and sensor gear  to exhaust camshaft. Install and release secondary tensioner  . 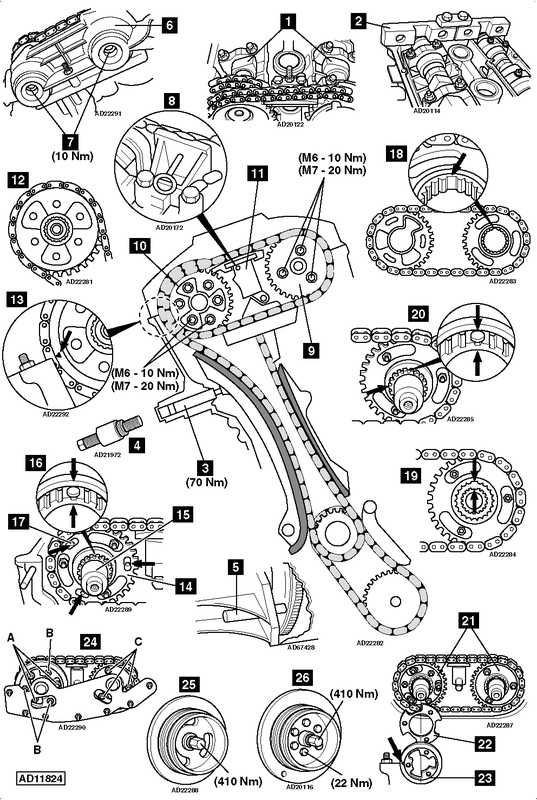 Set camshaft timing with tool as follows:NOTE: Remove gasket before fitting special tool  . Tool No.11 6 150. Install timing chain tensioner  . Check engine at TDC on No.1 cylinder. Use special tools. Remove camshaft timing setting tool  . Tool No.11 6 150. Install VANOS unit  .NOTE: Screws behind sealing caps have LH threads  . NOTE: Crankshaft pulley centre bolt MUST only be used once.